The Crimson takes a step back a night after a thrilling 3OT victory against Columbia, dropping its second Ancient Eight loss to Cornell. “I thought we were selfish and play in a manner that’s not deserving of this program,” said coach Tommy Amaker in a terse postgame conference. A night after winning a triple-overtime thriller that made national headlines, the Crimson appeared well on its way to earning a weekend sweep and improving to 5-1 in Ivy play. 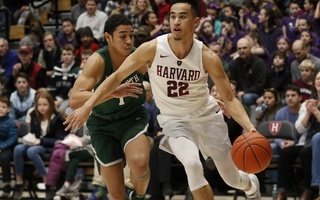 But after charging to a 15-point lead heading into the last three minutes of the first frame, Harvard (11-8, 4-2 Ivy) collapsed in the second half — being outscored 46-27. The Crimson’s 61-67 defeat came largely with Big Red star sharpshooter Matt Morgan silenced for much of the night, especially from deep. Morgan tallied 15 points to conclude the game, largely due to a late spurt of free throws. But the Ivy-leading scorer took just five attempts from three, converting on one. Instead it was a contribution of role players on the Cornell team — led by a second-half streak of triples from sophomore Jimmy Boeheim and junior Josh Warren — that pushed the Big Red(12-10, 4-2) over the edge. One final triple from sophomore Terrance McBride proved to be a dagger, as it extended a narrow Cornell lead to four with 33 seconds remaining. On the offensive end, the Crimson shot a respectable 51.2 percent from the field but accumulated 24 giveaways in an altogether-messy outing. The first seven minutes of the contests saw both teams combine for eight turnovers, which turned into an omen for the rest of this contest. 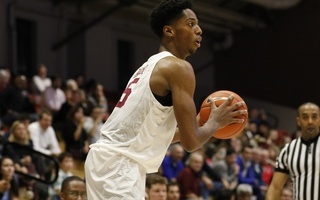 “Hunting for your shot, rather than one of our principles of letting the shot find you,” said junior guard Christian Juzang when asked to elaborate on Amaker’s reference to selfishness. 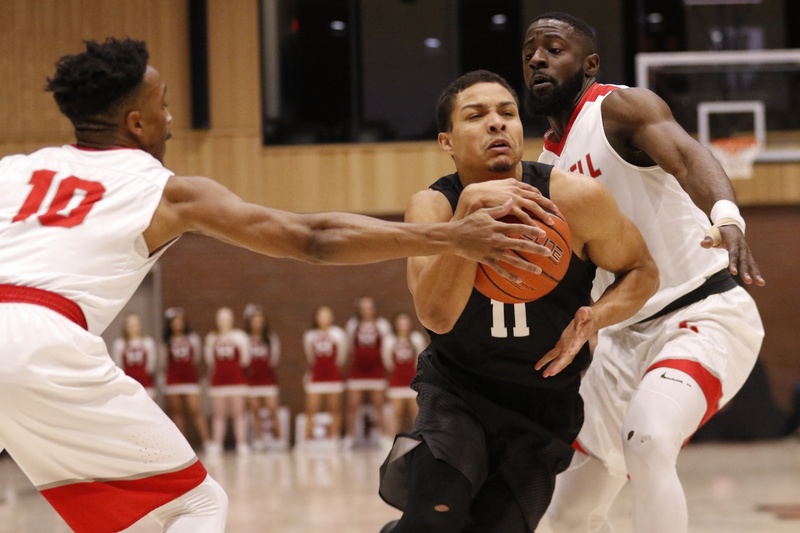 Although Coach Amaker emphasized that junior guard Justin Bassey’s absence Saturday night due to minor bruises was “not an excuse”, there was a clear gap in the Harvard defense throughout the night. Furthermore, junior Bryce Aiken was all but shut down in the second frame, after tallying a team-high 17 points in the first and a career-high 44 points the night prior. The Crimson offensive rhythm was also disrupted by Big Red coach Brian Earl’s decision to implement a full-court press with his team down double-digits in the second half. Although Cornell did not directly force a giveaway due to its press until 3:49 remaining in the half, Harvard struggled to settle into its familiar half-court set and relied on mid-range shooting to keep up with the Big Red’s flurry of triples. 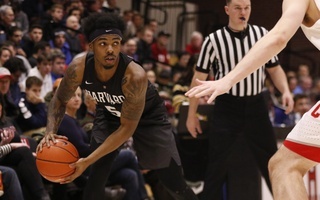 After fighting tooth-and-nail throughout much of the early portion of the contest, Harvard broke away with an extended 17-0 run from the 6:47 mark to 2-minute juncture in the first frame. 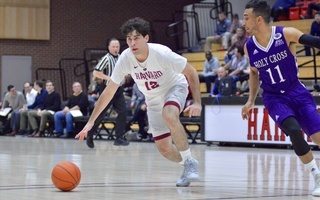 Sophomore Danilo Djuricic provided the opening triple to give Harvard its first lead of the contest at that late six-minute point, and the run was highlighted by an Aiken basket penetration play that saw him curl in an and-one conversion. However, a sluggish start to the second frame and a series of Big Red spurts brought the scoreline back to even at 47-47 by the final eight minutes of play. Coach Amaker attempted to inject first year Kale Catchings into the lineup for a spark, but the freshman was held in check and went scoreless in his brief four minutes of game action. A Lewis dunk off of a tip-save from junior Robert Baker at the 5:44 mark injected some energy to the Crimson side, but its brief 55-51 lead was quickly subsumed by critical buckets from Cornell’s McBride and accurate free throw shooting from Morgan. The Big Red broke through again at 62-59 off an and-one Morgan finish at the rim, but Juzang’s mid-range basket in response at the 1:48 point would be the last offense Harvard would see. With Princeton-Penn on the road next weekend, this reflection point for the Crimson will be as crucial as ever. Now 4-2, it secedes the top Ivy spot to Yale, who swept by the Quakers and Tigers this weekend. Outside of the result, this weekend was also alumni weekend, and several former Crimson made video announcements on the Lavietes screen. Among the list included Chris Egi, Christian Webster, Jeremy Lin, Keith Wright, Siyani Chambers, Brandyn Curry, and Kyle Casey.